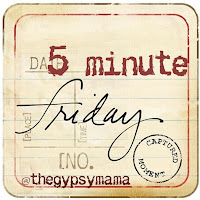 It’s Friday, and that means I’m linking up with Lisa-Jo (aka The Gypsy Mama) for another one of her Five-Minute Friday prompts. Just write, for five minutes, without going back to edit or revise (ok, I did add in the links afterwards). Her topic today is “A Few of My Favorite Things.” Ready? Set? We’ve lived here in Southern California for five years now. Moving when Cora was 6-weeks-old; was it really so long ago?! That baby girl has grown into a ready-for-kindergarten little lady. When we first got here everything felt so unfamiliar, so different from the Northwest. Gone were the evergreens and “the mountain” peeking out on a clear day. In its place I had rolling hills that were mostly brown, except in those few weeks of Spring and rain each April. Palm trees, beaches and sparkly sidewalks became my new surroundings. The unfamiliar made me ache for home, for family and safe. God told me to put down roots. I learned to love those springtime hills, the brilliancy of the green against the bright blue sky. We discovered birthday pizookies at BJ’s, and the best pizza in the O.C. at Brooklyn Pizza Works. I found fast food I’d actually eat at In-n-Out and Chick-fil-a. Before you believe that my favorite things are all food…I also discovered the family that God surrounded us with at our church; aunts, uncles, cousins and grandparents for our babies to fill the void of their relatives in Washington. A group of college kids, freshmen all those years ago, tugged at our hearts and empty our cupboards each week. Our kids have had so many firsts and milestones in this community. Fourth of July meant the County Fair in Pioneer Park, Halloween was the church harvest festival and trick-or-treating in the cottages behind our apartment. Memory upon memory has built up altars, remembrances, within my heart. But it’s time to go home. To the evergreens, Mt. Rainer and family. *No, this is not a joke. We’re moving this summer! What?! Crazy! Yay for home! I came to your blog just recently Melissa. Would you mind sharing why you moved from the beautiful Northwest (been to Seattle/Kirkland/Redmond) to California and are now moving back? Just curious. Congrats on going home. We live in Indiana. Our oldest daughter lives in Knoxville, TN and our youngest with her husband and our 4 year old grandson live in Powell, OH (near Columbus). Four hours away! My wife is getting antsy (and I miss seeing the little guy myself) but at this point don’t feel God has released me/us yet to go back home. I’ll be sharing on the longer reason next week, because it’s too long for a comment response. Living away from family is difficult. It really is about the release of God, though. No matter how much we might want something, we know it’s not worth it to go against God’s promptings. Moving is hard but you sound excited. Good luck, cant wait to follow along with your journey! My oldest started kindergarten last year. I thought I would cry my eyes out, but he was so excited that I could only be happy for him. I am interested to see if it will be different with her. Thanks, Jenny! :) We’re really excited to see what God brings about in this situation. Exciting. Congrats on your journey! Thanks, Dustin! How much longer do you guys have till the baby comes? Hey, guess what today is? I’ll give you a hint: Yesterday was Thursday, tomorrow is Saturday, and Sunday comes afterwards. This is like that one time I had a girlfriend I “loved” and then I cheated on her with another girl I “loved” and then went back with the other because I “loved” her. Actually, it’s nothing like that. Doing my happy dance!!! I just asked Craig last night if this was common knowledge because I’ve been trying not to spill the beans. So, now I’ll start making plans for me and you: i.e. Starbucks dates, concert tix, park with the kids!? Anything else? We might have to include the hubs every once in awhile. :) Blessings on your upcoming transition! It’s now common knowledge and beans can be spilled. :) Coffee beans? I like your plans…I cannot wait! Melissa this is such good news! I have missed you guys! Yes, that was purposeful. :) I was going to make it seem like I was announcing another pregnancy, but I thought my mom would have a heart attack. Haha! I’M SO EXCITED FOR YOU GUYS!!!!!!! I am excited for you guys, but so sad that you won’t be here. Please take us with you, we can help with babies (I mean I can :))! moving closer to family is very exciting!! So happy for you! Haven’t done my 5 minute friday post yet… mostly because I am in the most rotten mood ever and am having a hard time thinking of my favorite things… maybe counting some blessings would help snap me out of this funk!! Sometimes I have to do two posts, just so I can get the grump out first. :) Thanks, Julie Anne! Yay yay yay! I almost said, “You should take pictures of my kids when you guys move back up here!” the other day, and then I was like, “oops, wait, delete that part” lol. Visiting by way of Gypsy Mama this morning. I loved your post because I too am a Washington girl. I don’t live on the green side though. P.S. I am totally lovin’ your blog! I added you to my reader. Happy weekend! Same thing happened to me 16 ! years ago. God said, “You live here. Act like it.” And thusly the family God chose for you was found. Yay.